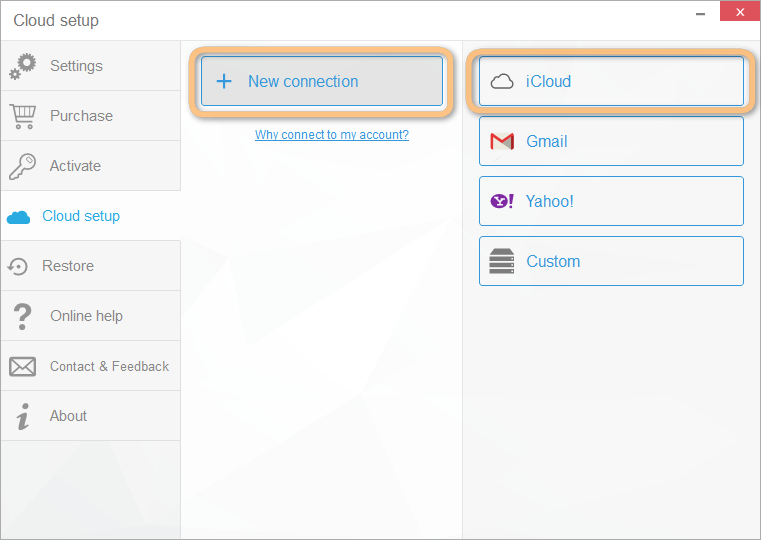 How to import contacts to iCloud? 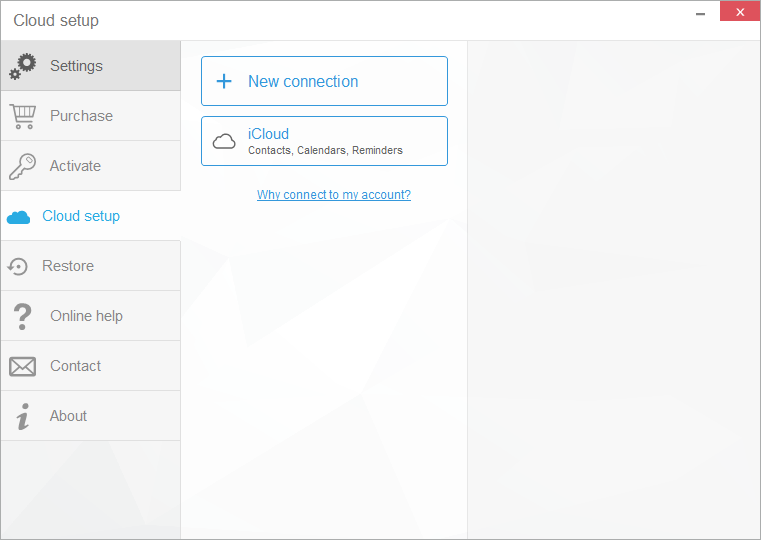 Home » How to import contacts to iCloud? 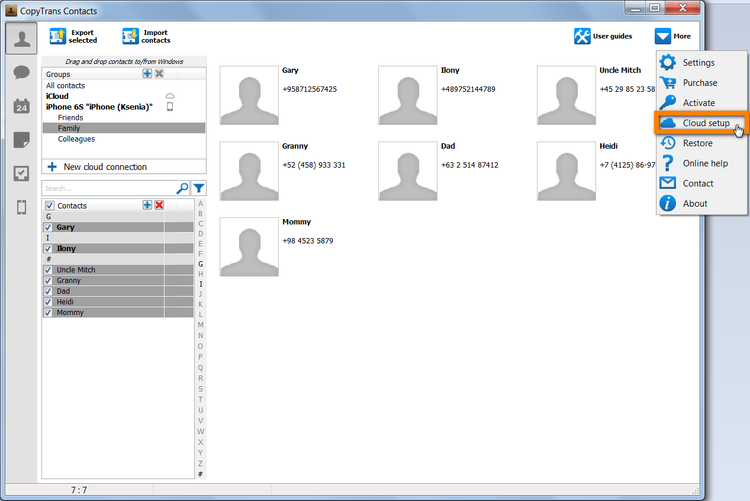 If you are looking for a fast and hassle-free way to move iPhone contacts to iCloud – you are reading the right article. This tutorial will explain how to import On my iPhone contacts to iCloud, no need for workarounds. Let’s go! If you need help installing CopyTrans Contacts, please refer to the Installation guide. Start the program and connect your iPhone (also works for iPad or iPod touch). Wait until all iPhone contacts load. Next, from the top right, click “More” and select “Cloud setup”. 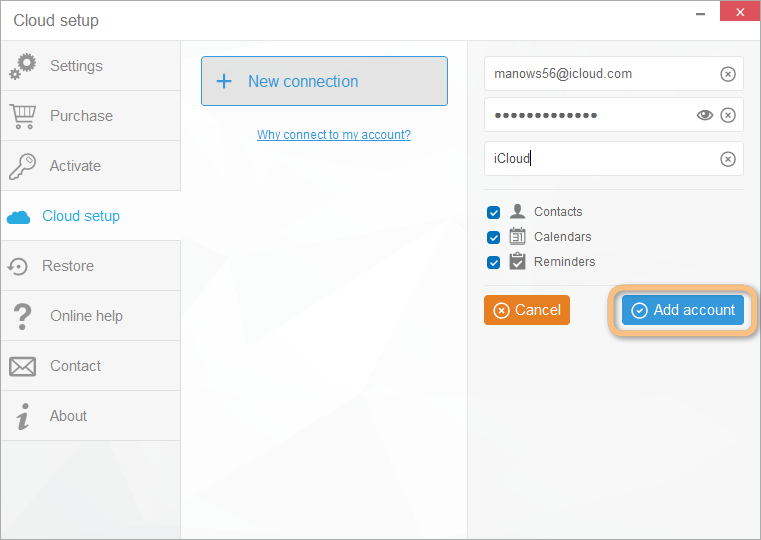 In order to be able to transfer contacts from iPhone to iCloud, you would first need to connect the iCloud account with CopyTrans Contacts. To do so, click “+ New connection” and then select “iCloud”. 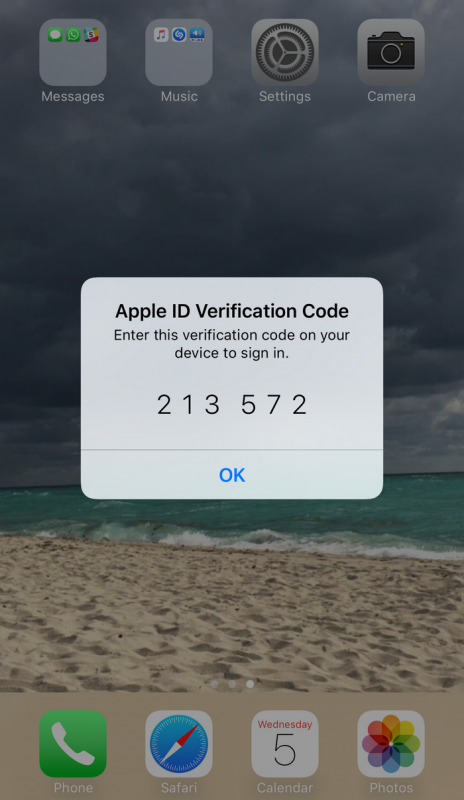 Enter the Apple ID and password associated with the iCloud account, make sure that the box next to “Contacts” it checked and click “Add account”. NOTE: We use secure SSL connection to maintain the privacy of your data. As soon as you are connected, you may close the window. Select all the iPhone contacts you wish to move to iCloud. 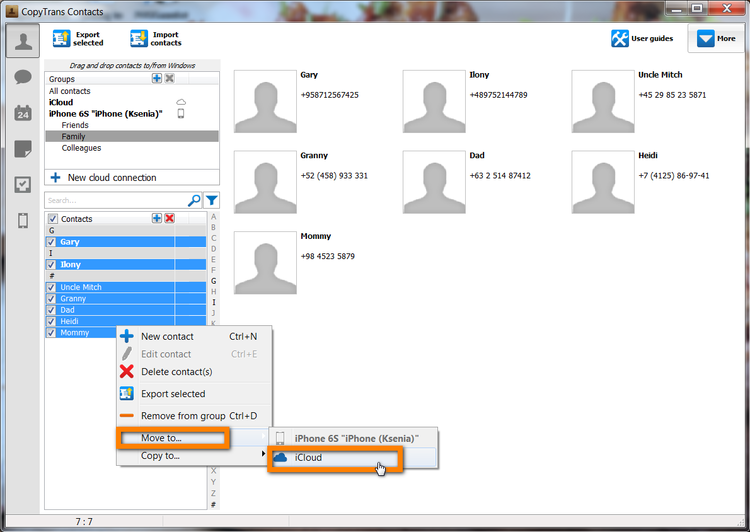 To select multiple contacts check the box next to each entry. To import all iPhone contacts to iCloud at once, check the box next to “Contacts”. Right-click on the selection and choose “Move to… > iCloud”. 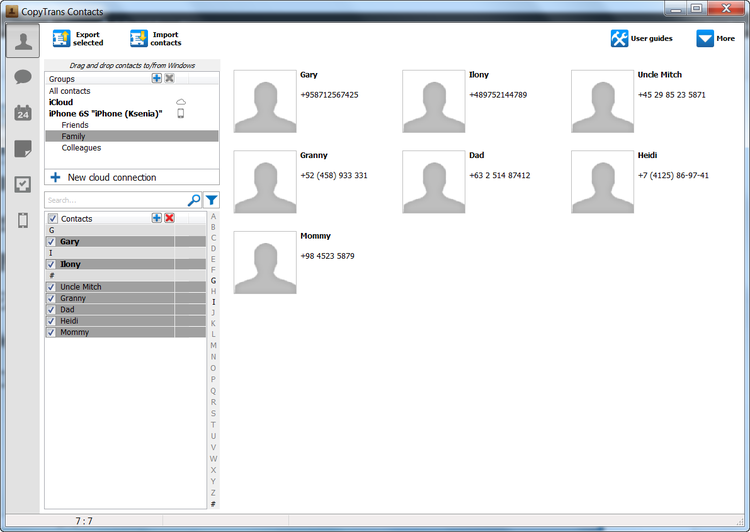 All selected contacts will be transferred to the selected iCloud account. A small cloud icon appears next to these contacts, indicating that they were moved to iCloud account. Congratulations! The iPhone contacts have successfully been imported to iCloud.